A New York hard rock trio, highly regardd by some. Marc Bell later played with Richard Hell's Voivoids and the Ramones. Kenny Aaronson went on to play with Stories, joined the Rick Derringer Band and played with several hard rock groups including HSAS (Hagar, Schon, Aaronson, Shrieve). He also played on Blue Oyster Cult's Club Ninja album. Richie Wise and Kenny Kerner (their producer and collaborator) went on to produce the first two Kiss albums. Richie also has a producer credit and photo on Savoy Brown's Greatest Hits/Live. 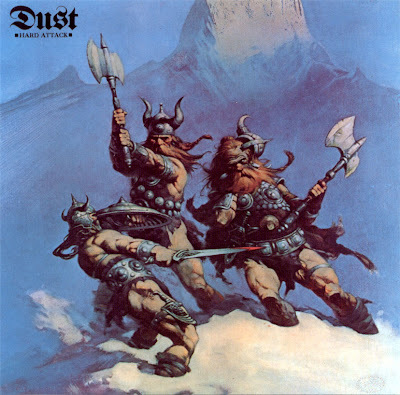 It's rumoured that Dust also laid down some tracks for a third album that was never finished. Piano and organ by Fred Singer.